• Manufactured by Davis-Anderson Merchandising Corporation (Davis-Panzer Merchandising) aka Legendary Heroes. • Distributed by Anchor Bay Entertainment. Anchor Bay is now a division of Starz Media, Starz being the company that produced Spartacus, a TV series also produced by Robert G. Tapert and Sam Raimi…see the connection ? 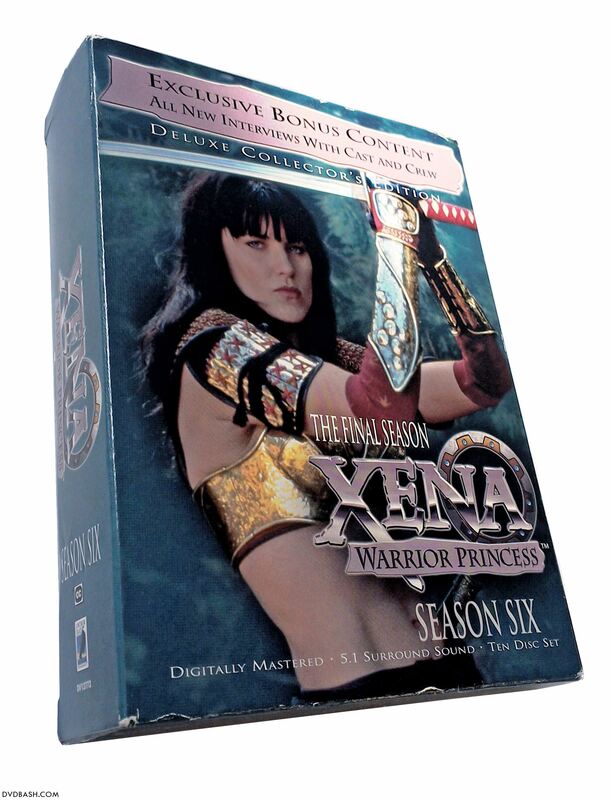 This entry was posted in DVD Technical matters - Special Features, TV Series and tagged 10th Anniversary Collection, Adrienne Wilkinson, Alexandra Tydings, Alti, Amarice, Anchor Bay Entertainment, Aphrodite, Archangel Michael, Ares, Autolycus, B0007DA3VG, B0009KA2R2, Borias, Bruce Campbell, Caesar, Callisto, Charles Mesure, Claire Stansfield, Complete TV Series DVD Box Set, Cyane, Danielle Cormack, Davis-Anderson Merchandising Corporation, Discord, Ephiny, Eve, Falafel, Gabrielle, Hercules, Hercules The Legendary Journeys, Hudson Leick, Iolaus, Jennifer Sky, Joxer, Karl Urban, Kate Elliott, Kevin Smith, Kevin Sorbo, Lila, Livia, Lucy Lawless, Marton Csokas, Meighan Desmond, Melinda Clarke, Michael Hurst, Paul Norell, Renée O'Connor, Robert G.Tapert, Robert Trebor, Salmoneus, Shiri Appleby, Starz Media, Studios USA, Tara, Ted Raimi, Tsianina Joelson, Universal Studios LLLP, Velasca, Victoria Pratt, Willa O'Neill, www.legendaryheroes.com, Xena Warrior Princess, Yakut by dvdbash. Bookmark the permalink.